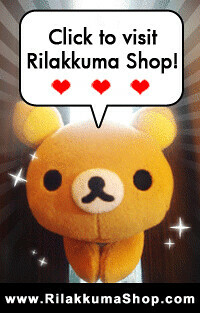 Rilakkuma Shop is looking for the CUTEST Rilakkuma contest photo! Grab your Rilakkuma, Korilakkuma or Kiiroitori and take some photos now! The photo can include anything, even you! As long as Cute Rilakkuma theme is the main focus! If you are looking for some examples, you can browse through our Facebook Fan Page wall posts, we have been posting some interesting photos that we shot or found on the net! 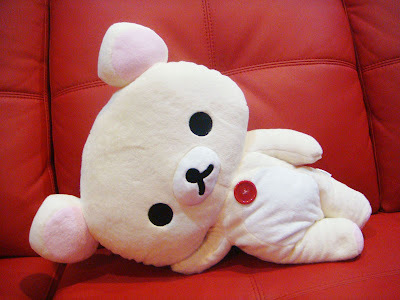 The contestant with the winning entry will receive this Korilakkuma Plush! It's half a meter tall and the retail price is worth SGD 63.80! We will ship this to you, FREE! - The contest photo with the most likes in our Facebook Fan Page Photo album at the end of the liking session will win the prize! - This contest is open to International, and we are pleased to announce for this contest, we will pay the shipment fee for the prize! - Each person is limited to only one photo entry for contest. - The contest photo MUST be taken by you. To verify that, you need to take a verification photo that shows you with the same plush and venue in the submitted contest photo. Failure to do so will result in auto-disqualify. - You are allowed to use photoshop or any other software for color correction, brightness & contrast etc. - The contest photo must be at least of 1024x768. Basically clear and pleasant for viewing. - Please make sure the photo is the final version that you want to submit for the contest! - At the end of the deadline, within 1-2 days, all submitted photos will be posted via our Facebook Fan Page photo album and open for voting. - Contestants, please tag yourself on the contest photo. - The photo with the most likes win the prize! - Results will be announced through Twitter, Facebook after the liking session closed and we will contact the winner via email to verify shipment details. Rilakkuma Shop is looking forward for your entry!